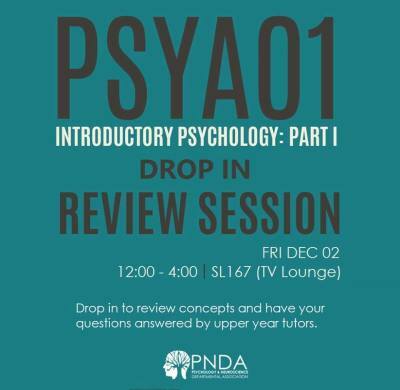 PSYA01 Students, be sure to drop in to PNDA's review session on Friday, December 2 at 12pm to 4pm! It's in SL167 (the TV Lounge). We'll have upper year tutors at the session so you can review concepts and have your questions answered. 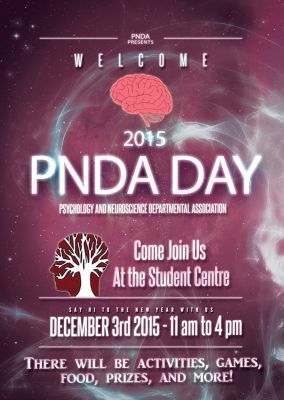 PNDA Day will be happening TOMORROW - Thursday, December 3rd from 11am to 4pm in the Student Centre! It will be a great opportunity to both get involved, and learn about what PNDA has to offer for psychology, neuroscience, and mental health studies students. There will be games, activities, prizes, and more! We hope to see you there. 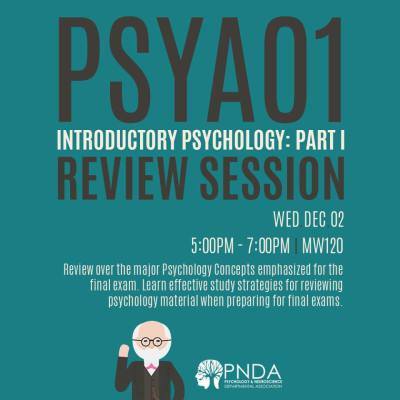 Attention all PSYA01 students - the PNDA will be hosting an exam Review session where students from the budding scholar program will be presenting chapters that will be emphasized in the Psychology final exam. Come out to MW 120 from 5-7 on Wednesday December 2nd to review over concepts presented in each chapter along with study skills from trained study skill peer coaches about effective study strategies when preparing for psychology final exams - we hope to see you there!